Are you ready to see the one that started it all?? That’s right, heavy metal fans, The Prince Of Darkness himself returns with another farewell tour – and this time, its really the last one. 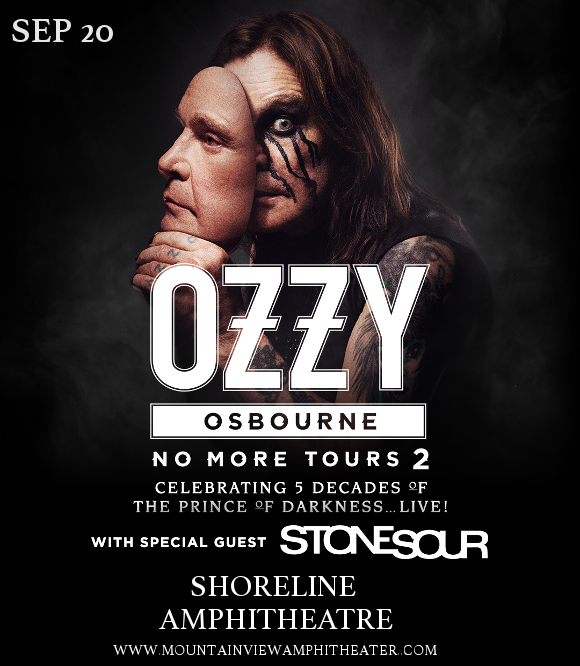 This is your final chance to see the legendary Ozzy Osbourne, live at the Shoreline Amphitheatre on Saturday 20th October 2018!! Tickets on sale NOW and disappearing fast – get yours while they last!! Rising to fame in the 70s as the lead singer of the band Black Sabbath, Ozzy immediately gained himself a personal reputation for his piercing voice, wild onstage antics and distinctive Brummie accent. With Black Sabbath, he helped to pioneer the heavy metal genre, leading to him being frequently called “The Godfather of Heavy Metal”. Following Black Sabbath, and under the guidance of his wife and manager Sharon Osbourne, Ozzy embarked on a successful solo career, going on to start and curate the Ozzfest heavy metal and rock festival tour in 1996, which continues to run to this day. Get ready to be part of that celebration live – book your Ozzy Osbourne tickets NOW while they last! !